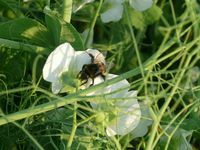 Starting in March 2016, a knowledge transfer network consisting of 75 conventional as well as organic farms growing field peas (Pisum sativum) or field beans (Vicia faba) is currently established in Germany. Cultivation of peas and beans has been on a rather low and stagnating level in Germany in the past years. This is due to some challenges during cultivation, but also to low economic incentive for the farmers. This network (DemoNetErBo) shall expand and enhance the cultivation as well as the usage of field peas and field beans sustainably and improve the value gained by the farmers when growing peas and beans. Special focus is therefore on the development and presentation of legume value chains for feed and food production spanning all levels from breeding until the usage by the consumer. Hence, the farms are demonstrating diverse best practice examples for cultivation, processing, and utilisation of those two grain legumes. The overall aim of this project is to meet the growing need for regionally produced non-GMO protein crops. The project is supported by funds of the Federal Ministry of Food and Agriculture (BMEL) based on a decision of the Parliament of the Federal Republic of Germany via the Federal Office for Agriculture and Food (BLE) under the Federal Protein Crop Strategy.